Today, I watched a video that inspired me to blog (I know, it’s been a while). One of the things that I spend a substantial amount of time talking about with my clients is meat and why it’s important to choose quality over quantity. I totally understand. I get it. Quality meat does cost more. When my family decided never to eat supermarket “regular” meat again, we had to eat a lot less meat all together because we really couldn’t afford to make the switch to grass-fed, locally raised beef every night. Not that you should eat beef that much anyway, but the same goes for poultry that is raised well. It’s more expensive. Honestly, what’s good for our budget has also turned out to be good for our health as well. If you’ve never looked into the reasons and importance of meat quality, I’m going to share a video with you below. BUT first, let me just run down the basics about this topic – I promise to keep it brief but informative. I’m going to touch on beef in this blog, but it’s equally important not to eat sick poultry meat either. In respect for length of this post, we’ll only talk beef. 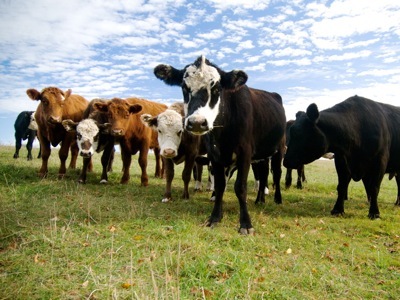 The United States is the leading beef producer in the world. Between 24 and 27 billion pounds of beef are produced each year in the USA. Did you get that? 24+ BILLION. Conventional cows in the USA (so, any supermarket meat that you buy at any major supermarket chain – even those that state “all natural” on the label) are raised on feed which consists of GMO alfalfa, GMO corn, barley, wheat, protein sources (only 11% of their food) and roughage (hay) and maybe a few other added grain choices. Higher percentages of grain go to 700+ pound cattle (which is what the farmer wants). This higher percentage of grain DOES NOT produce a leaner meat. It’s the opposite effect. Just like humans, grain consumption increases the percentage of body fat. I want you to read this snippet that came directly from the “manual” from Penn State Ag program. I’m not picking on Penn State, there are dozens more exactly like this and chances are, your local extension has one too. Increasing forages in the diet of feedlot cattle will generally increase the cost of weight gain (due to slower weight gain and higher carrying costs) when grain prices are reasonably low. Specific ration composition is determined by the combination of available feedstuffs that will minimize the cost of weight gain, provide a balanced diet, and reach desired endpoints for the market. This feed combination will vary as grain prices change. Performance enhancers such as growth-stimulating implants can also be used. Research has shown that they provide the greatest return of almost any feedlot practice with complete safety to consumers. The final market for your beef and consumer acceptance, however, will dictate whether you should use performance enhancers. As you can see here, it’s all about the cost, not about the animal or the quality of the meat. I struck out the complete safety to consumers because it’s simply not true. But that is another blog post. Cattle feed lots and their terrible impact on the environment is also a whole blog post in itself. The way cattle are raised in the USA is what gives me the issue with conventional supermarket meat. They are plumped up in the fastest way possible, in absolutely miserable conditions that cause super bugs (germs), which make them use crazy amounts of antibiotics. This is not what I want to nourish my body with. If you eat sick meat, will you be healthy? If you eat sick meat, do you feel good about the treatment of the animal? I’m not going to send you a video of the disgusting feed lots in this country. I am going to encourage you to watch this video (link will redirect you to TakePart.com). It is about a family rancher in Blufton, Georgia (White Oak Pastures) and my favorite line from the short video is “you let them express instinctive behaviors” when he was talking about good parenting. He thinks of himself as the animals parent, their keeper. He is proud to offer them this environment while they are being raised to nourish us. Want to know what else I like about raising meat the right way? Watch the video, please, and change the world with one purchase at a time. Stand up for those who cannot stand up for themselves.